The best way to get around Slovenia is by car, since the roads are well maintained, drivers are friendly, and there are lots of places you might want to explore. Europcar (www.europcar.si/en/) has good prices and convenient pickup and drop-off locations in Ljubljana. 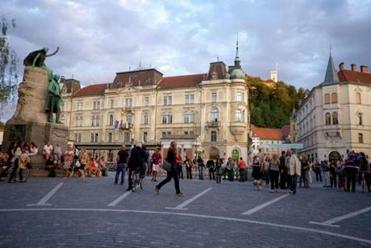 In Ljubljana, consider using Airbnb (www.airbnb.com) for the best deal on an apartment close to the old city near the river. Outside the capital, some of the friendliest, most authentic, and most comfortable places are in family-run tourist farms and guesthouses, where the food will be local — and good — and prices range from $30-$50 per person per night, usually including breakfast. Run by a friendly family, and ringed by pointy mountains, this tourist farm is the perfect place to hike parts of the Soca River Trail, take in the scenery, and enjoy the food. $62 a night; single-night visits incur an extra $21 charge. The view was something like the Swiss Alps overlaid on Yosemite Valley, except sized down and without the crowds. This farm gets universally good reviews, and its perky host will put a smile on your face. The food is outstanding, the local honey liquor perfect after a long day of hiking or exploring, and the morning and evening views of mist-shrouded mountains impossible to beat. $72-$110. This farm has a variety of rooms, full apartments, and even a hay barn, with amazing views of the headwall at the back of the Logar Valley. $83-$152.